Happy Halloween! OK, so I don't have a Halloween card to show you today... instead I have another card for my Christmas stash (though the colors are very fall-ish). Today's card combines 2 challenges... First is Sparkle's Christmas Card Challenge #47, which is to use some kind of cooked/baked holiday goodie. The first image I thought of was this adorable Pink Cat Studio digi, Itty Bitty Betty - Baked a Pie. I used Julee's Mojo Monday #110 sketch. I first sized my image to accommodate the sketch, printed and colored her with Copic markers. 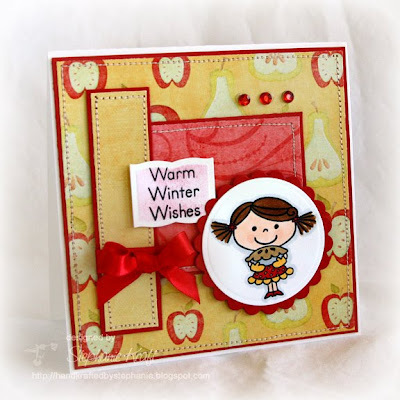 I really loved Julee's stunning Weekend Wreath card here. The red and gold make for a such a beautiful combination. I decided to print out some digi papers from the Sweet Shoppe Designs kit, The Good Earth. When I think of pies, I automatically think of apple since that is the pie my mom used to make the most when I was growing up! I don't make apple pie, but I do make a pretty tasty apple crisp... I think I'll be making one this weekend! I hope you have a safe and wonderful Halloween! Thanks so much for stopping by! Accessories: Circle, Scalloped Circle and Labels Seven Nestabilities (Spellbinders); Markers (Copic), Rhinestones (Kaisercraft), Ribbon, Foam tape, Thread, Sewing machine. Such a darling card! Apple Crisp sounds delicious! Love this card and the image you have used. PCS images are really fun.